Click here for a video preview of this year’s Super Bowl Experience! 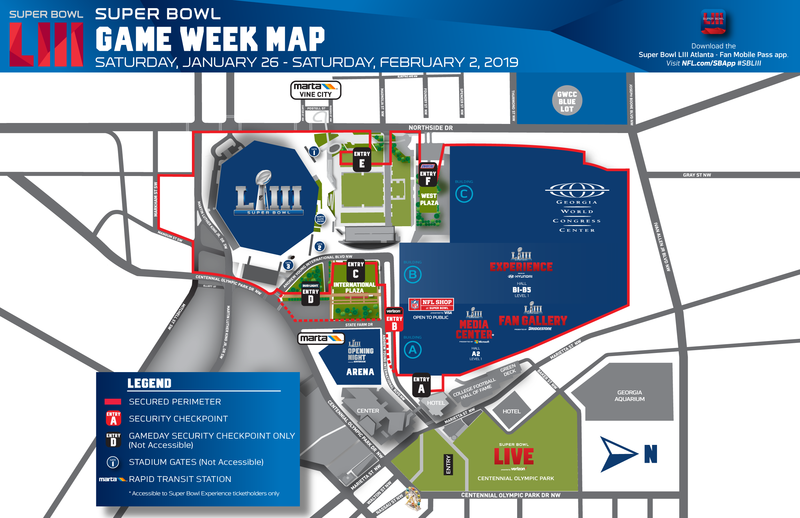 Super Bowl Experience Driven by Hyundai is the NFL’s interactive theme park celebrating Super Bowl LIII from Saturday, January 26 - Saturday, February 2 in Georgia World Congress Center (Building B). At the Super Bowl Experience, you can participate in immersive exhibits and interactive games, take photos with the Vince Lombardi Trophy, collect free NFL player and Legend autographs, get an up-close look at the collection of all 52 Super Bowl rings and more! The most exciting, continuous event surrounding Super Bowl LIII also gives you the chance to train like an NFL player at Combine Corner with the 3 Cone Drill, 40-Yard Dash and the Broad Jump! After testing your skills on the field, see what happens off the field with behind-the-scenes access to NFL Network player and celebrity interviews at the Bridgestone Fan Gallery located at Georgia World Congress Center (Building A). 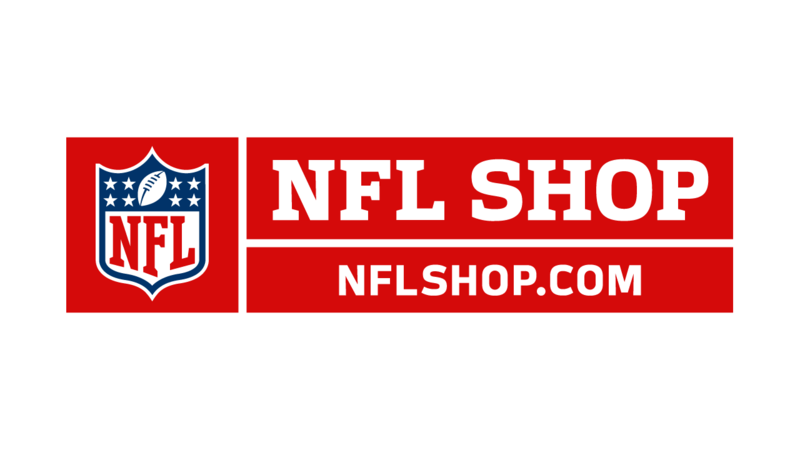 Commemorate your fun experience with a stop by NFL Shop at Super Bowl presented by Visa, home of the largest collection of Super Bowl LIII merchandise! Share your experiences using #SBLIII. For exclusive access to Super Bowl Experience and the chance to win tickets to Super Bowl LIII, register for Fan Mobile Pass by visiting nfl.com/fanmobilepass. Nickelodeon’s Double Dare at Super Bowl! 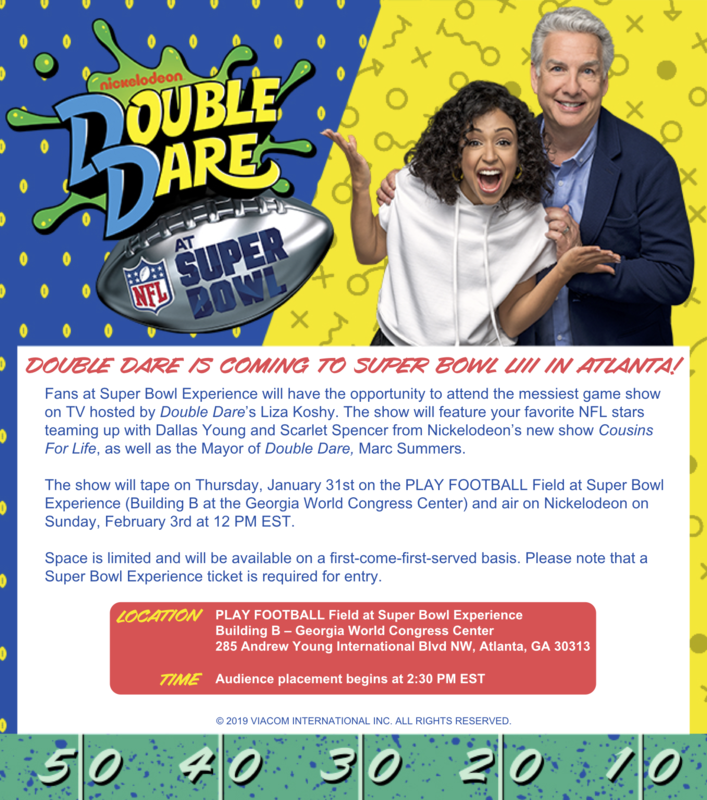 Experience the messiest game show on TV, Nickelodeon’s Double Dare, at Super Bowl Experience Driven by Hyundai on Thursday, January 31! The show will feature NFL stars teaming up with Dallas Young and Scarlet Spencer from Nickelodeon’s show, Cousins for Life. The show will tape on the PLAY FOOTBALL Field and space limited and available on a first-come-first-served basis. A Super Bowl Experience ticket is required for entry. Audience placement begins at 2:30PM EST. Buy tickets at ticketmaster.com/sbxonsale. Tickets will also be available for purchase at the box office located inside Building B of the Georgia World Congress Center. The box office will close two hours prior to event closing time each day. There is no re-entry after ticket is scanned. Note: Monday, January 28-Wednesday, January 30 ONLY, for each $20 adult ticket purchased at the box office, the purchaser will be entitled to receive up to 3 complimentary tickets for children 12 & under. Additional tickets for children 12 & under will be $5 each on those days. Complimentary and discounted child tickets must be for the same day as the accompanying adult ticket. Complimentary and discounted child tickets may only be purchased at the box office on the day of the event. This offer is subject to ticket availability. The NFL reserves the right to close ticket sales and/or this offer at any time based on the capacity of the venue and the event. Please note: SBXTRA tickets may be purchased for $55 for both children and adults. This ticket includes a general ticket to Super Bowl Experience which is required for entry into the event. SBXTRA wristbands are valid for the entire day of issue beginning with the time slot that you purchased. Everyone in your party using SBXTRA must have an SBXTRA wristband. Only 50 SBXTRA wristbands are available each hour. Please do not attempt to pick up your SBXTRA wristband prior to the time slot that you purchase it for. Questions? Email superbowl.experience@nfl.com or call 404.586.7253. USAA and the NFL are proud to offer Super Bowl Experience Driven by Hyundai tickets at a discounted price for eligible active and non-active military and their families. Please note that ticket prices vary per day between 1/26/19-2/2/2019. This offer is not valid on January 28th, 2019, as Super Bowl Experience will be free to all active and non-active military and their families upon showing proper identification. Upon ID.me verification, eligible persons will receive a military discount on available Super Bowl Experience tickets. *Military Appreciation Day: All active and non-active military and guests gain free entry upon showing proper government identification. Tickets are available for purchase below! Adults: $35 | Children (12 and under): $25 | SBXtra (Fast Pass): $55 for children and adults. Ticket prices include all games and attractions.